Yesterday we had a great giveaway from Merle Norman of Seneca - the winners have been contacted. You can see who won by visiting yesterday's post. Today we are excited to introduce you to one of our newest sponsors - Little Big Fan! This online shop has the most adorable things for your little fans... hence their tagline "Big style for little fans". 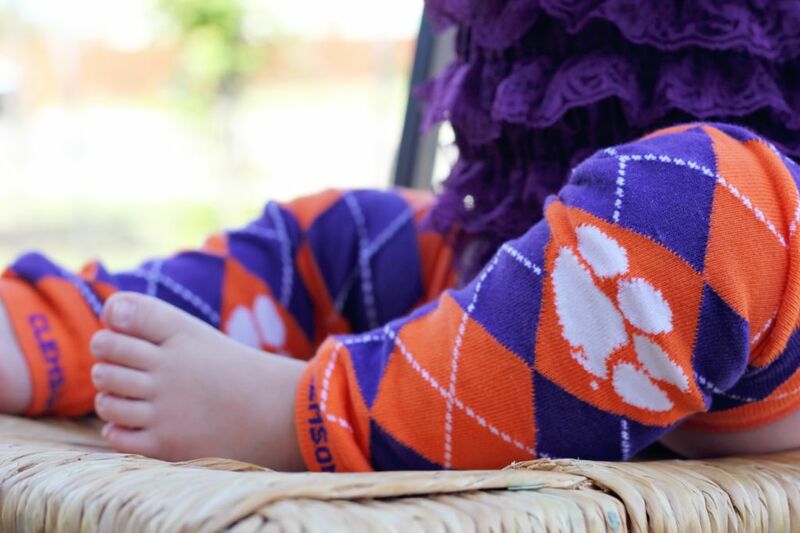 Little Big Fan is in the process of growing their Clemson products. 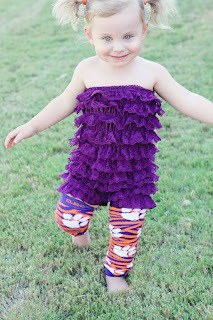 However, you can already buy these super adorable Clemson leg warmers. How cute are these? These leg warmers would be the perfect layering accessory for your little ones during football season. Slip them on under those cute dresses or cheer outfits when the sun goes down and the weather gets cooler. Slip them over leggings, tights or jeans for extra warmth on the really cold game days. Little Big Fan is excited to partner with us in celebrating the countdown to Clemson's first home game - 4 more days - so they are offering one very lucky Clemson Girl reader a bundled prize of their Clemson leg warmers. 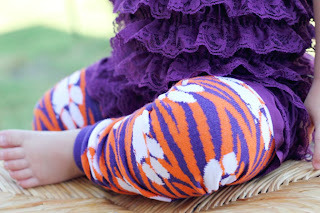 So the winner will get a pair of the argyle leg warmers and a pair of the tiger stripe leg warmers! a Rafflecopter giveaway Deadline for entries is Midnight tonight! We will randomly draw a winner and contact the winner via email tomorrow, Wednesday, Sept. 5th. The winner will have 48 hours after we send the email to contact us or we will draw a new winner. Visit this blog post tomorrow to see who won! Special thanks to Little Big Fan for sponsoring today's adorable giveaway!